In today’s economy, gaining and sustaining a competitive advantage is harder than ever. 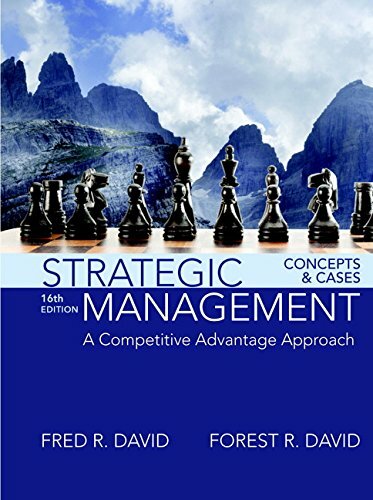 Strategic Management captures the complexity of the current business environment and delivers the latest skills and concepts with unrivaled clarity, helping readers develop their own cutting-edge strategy through skill-developing exercises. The Sixteenth Edition has been thoroughly updated and revised with current research and concepts. This edition includes 30 new cases and end-of-chapter material, including added exercises and review questions. This title is also available with MyManagementLab–an online homework, tutorial, and assessment program designed to work with this text to engage students and improve results. Within its structured environment, students practice what they learn, test their understanding, and pursue a personalized study plan that helps them better absorb course material and understand difficult concepts.